"The Hummer" E-zine brings you the latest additions to The Hummingbird Guide website, many useful tips to learn more about them, how to attract them, how to keep them at your feeders, tips and reviews of the latest hummingbird products, discount promotions from our store, festivals, birding tours, and anything interesting relating to hummingbirds that we can find for you. Issue #005, June 16, 2011. 1) BirdCam Sweepstakes Entry Details. 2) Plant a Hummingbird Vine to Attract Hummingbirds. 3) Hummingbird Guide Facebook Page. 4) Shop for Everything Hummingbirds....Special E-zine subscribers discount. 5) Contact Us with your suggestions for future E-zines. We appreciate your loyalty to Hummingbird-Guide.com and are so pleased to announce this wonderful sweepstakes in collaboration with Wingscapes Inc.
One Wingscapes BirdCam 2.0 valued at $225.00, will be awarded to one winner each week for 3 consecutive weeks! First, some details about this fabulous BirdCam Prize! The highest-resolution BirdCam, the BirdCam 2.0 has a timelapse feature and a flash for nighttime photos. Easy enough for anyone to use, but powerful enough for serious bird watchers to enjoy, the BirdCam 2.0 has the features and flexibility you need for incredible bird photography. The BirdCam 2.0 takes 8-megapixel, high-resolution photos and videos of your backyard birds. And with a timelapse setting and a flash for nighttime photos, you'll see more than ever before. Anyone who loves birds is sure to be amazed by this innovative bird watching tool! And thanks to the flash, you can capture photos of nighttime birds such as owls and nighthawks. Go to our Facebook Page Hit the "LIKE" button (if you're not already a fan), go to our "WALL" to see the post for the next step to enter the sweepstakes. Its A Must to Attract Hummingbirds! 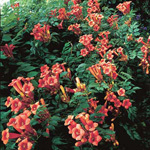 A Hummingbird Vine is actually a Trumpet Vine with long tubular nectar rich flowers that the hummingbirds love. These vines are exceptionally easy to grow and care for. Direct Gardening where you can buy direct and save on hummingbird vines and perennials. We found this great price on a convenient package deal to plant your complete Hummingbird Garden. It includes all the plants you need to get started. 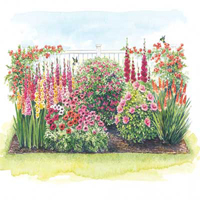 Visit our "Hummingbird Flower Garden" page to find the link to purchase the "Hummingbird Garden Package". If you haven't already, you just might like to become a fan on our Hummingbird Guide Facebook page! Especially with a chance to win the BirdCam 2.0! We now have over 1124 fans, more than double since our last newsletter. I'm sure your hummers have arrived, get out your camera and send us some shots. Use promo code: "thehummer" for a Special 10% Discount to our e-zine subscribers which you can use in our store.